Artist Rebecca Dudley crafts each tiny leaf, flower, and creature that appears in Hank's forest in breathtaking detail, bringing the sunlit woods to life. 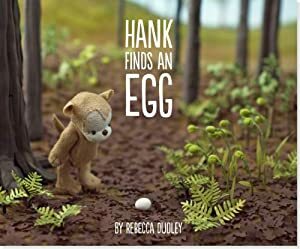 From delicate ferns to the glow of Hank's little campfire, Hank Finds an Egg immerses you in its vivid miniature world. In this charming tale, told without words, Hank's endearing and genuine kindness will inspire readers young and old alike to believe in themselves and the goodness of others. This book is a delightful sequence of photographs with little characters made of cloth and other objects. You tell the story as you see the photographs. Hank finds an egg and he is determined to give the egg back to the mother bird but has some challenges. Through the photographs the reader will see how Hank eventually, through creativity on his part, delivers the egg to the mother bird. The ending is sweet as the little hatched bird visits Hank, almost as a "thank you". This book will develop verbal language as you and your child tell the story together.